There’s a new sign in town, well it’s actually a plaque, the R4-11aP CHANGE LANES TO PASS (“CLtP”)was just recently added to Arizona’s Manual of Approved Signs (MOAS) in March of 2017. 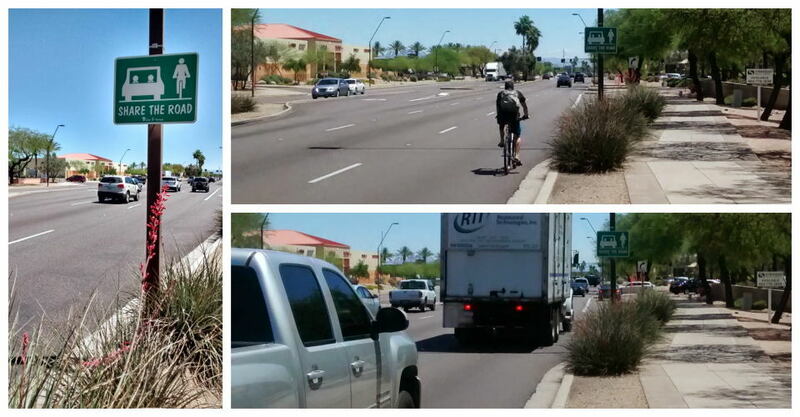 The sign is available to be added as a plaque in conjunction with the pre-existing R4-11 (Bicycles) MAY USE FULL LANE (“BMUFL”), which made it’s debut in the 2009 edition of the MUTCD, and was finally added to Arizona’s MOAS in June 2013.
bicycle and a vehicle side-by-side safely. In this situation, bicyclists need not (legally) ride as far to the right as practicable, but rather are instructed to ride near the center of the lane as best safe practice, this position will make the bicyclist more visible to other motorists, giving them more time to avoid abrupt, unsafe movements. As noted in Table 9B-1. Bicycle Facility Sign and Plaque Minimum Sizes of the MUTCD the minimum size of this sign is 30″ wide. 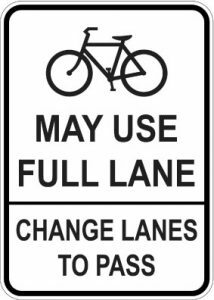 01 Other regulatory signs described in Chapter 2B may be installed on bicycle facilities as appropriate. Parts of the Natchez-Trace parkway was (recently?) signed with BMUFL / CLtP signage. 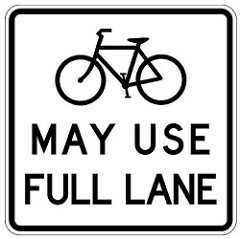 Bicyclists are required by federal rules (see two-abreastness) to ride single file; this is not a conflict, just pointless, the lane is too narrow to share so bicyclists (any number of bicyclists, including one) may legally, and should, control the lane, while motorists who wish to travel faster may change lanes to pass when safe. See this criminal driver hit-and-run caught on camera running down a bicyclist on the parkway.